What a year…and it’s almost gone! I hope you got everything done that you wanted too….I know that I will be transferring a few of my goals from this year onto next…. I am ok with that. You might find this odd, but one of my goals this past year was to get dressed more….I know I know. I am a mom who works at home. There are many days that we never-leave-the-house, so why get ready…. I made a stronger effort to get ready more this past year….. My conclusion, it helped me stay more focused and productive. Part of getting ready was to actually wear some jewelry. I always alway always forget jewelry. 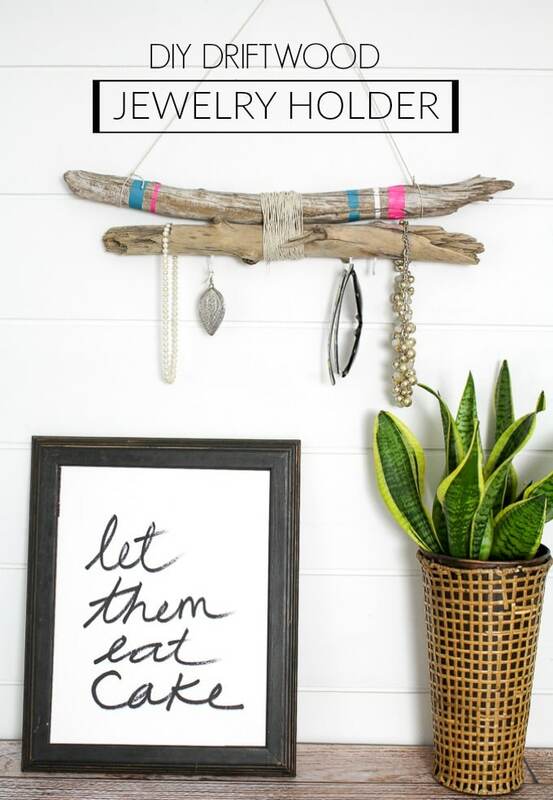 I made this fun new jewelry holder to help me to remember to wear it more often. 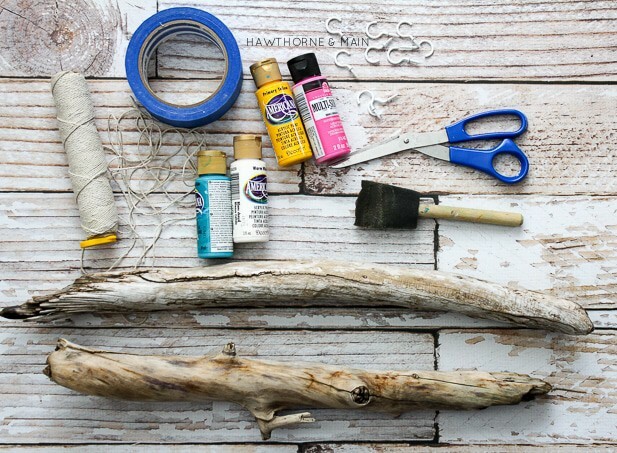 Today I am going to show you how to make this DIY driftwood jewelry holder. This is Shonee from Hawthorne and Main and I am trilled to be with you today. 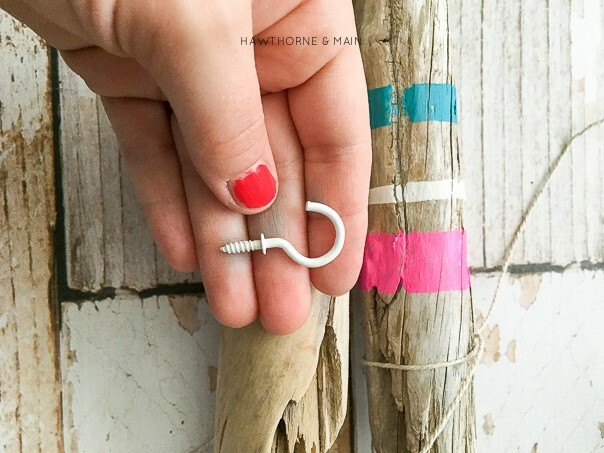 Hawthorne and Main is the place to find all sorts of DIY projects including our adventuring in fixing up our fixer upper. 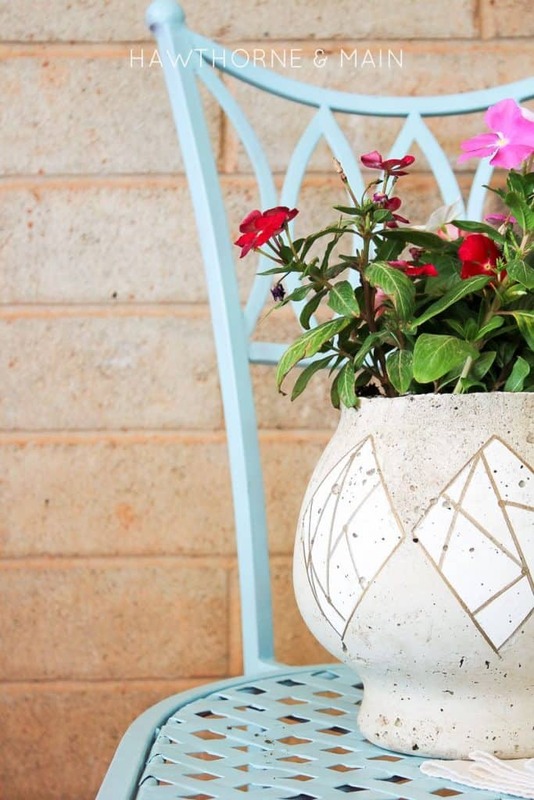 I love to share rustic modern craft and home decor ideas. Make sure that the wood is cleaned really well and let it dry before you start to assemble it. 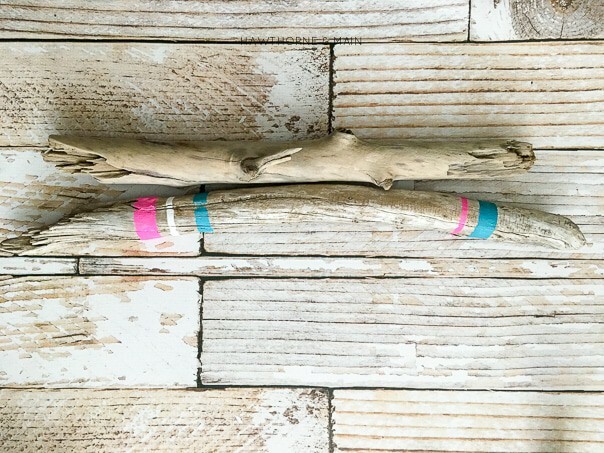 Wrap some painters tape around the drift wood in any pattern you like. Paint a few colors of your choice. Make sure that the tape is pressed down very firmly. The wood can be rough and bumpy. You want to make sure that no paint bleeds under the tape. Gently dab the paint onto the wood using a paint brush. Doing a couple of lighter coats of paint will be better than one thick coat. After the paint is applied remove the tape and let dry. 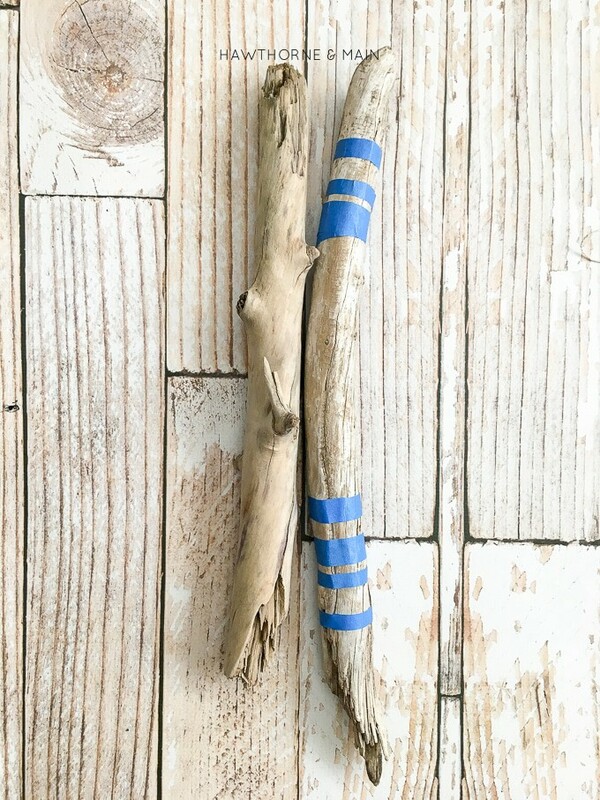 After the paint is dry, use the string to tie the two pieces of driftwood together. Begin my making a figure 8 pattern around the two pieces of wood. This will help to secure the wood together better. 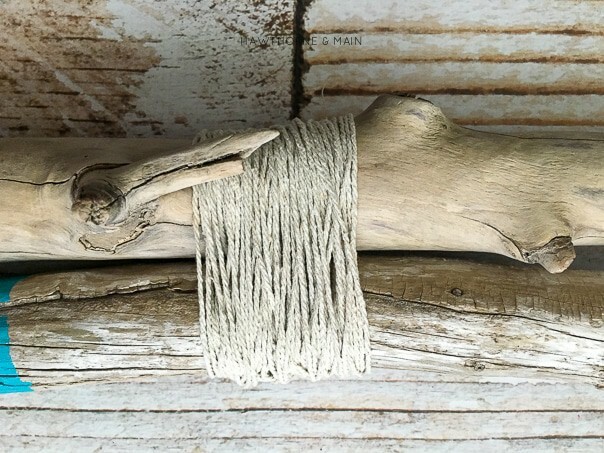 Continue to wrap the string around the driftwood until you are happy with how it looks. Take a couple of cup hooks and add them to the bottom of the driftwood. 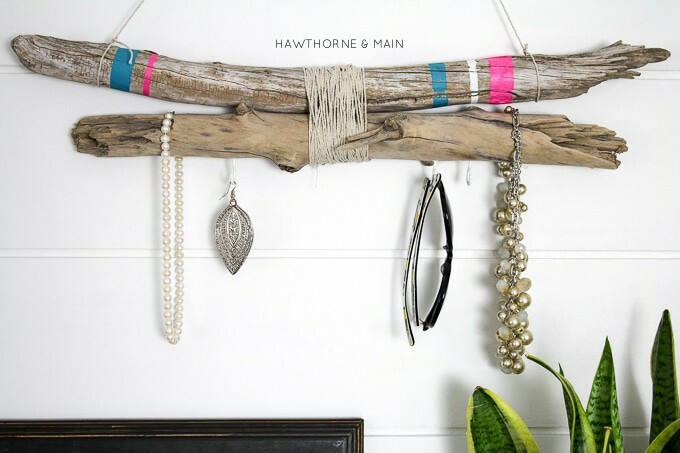 Finally tie a piece of string to the top hang your new driftwood jewelry holder. Now, I am off to grab a new pair of earrings…. because hey, I gotta keep my goals! I would love to connect! You can find me on Instagram, Pinterest and Facebook. 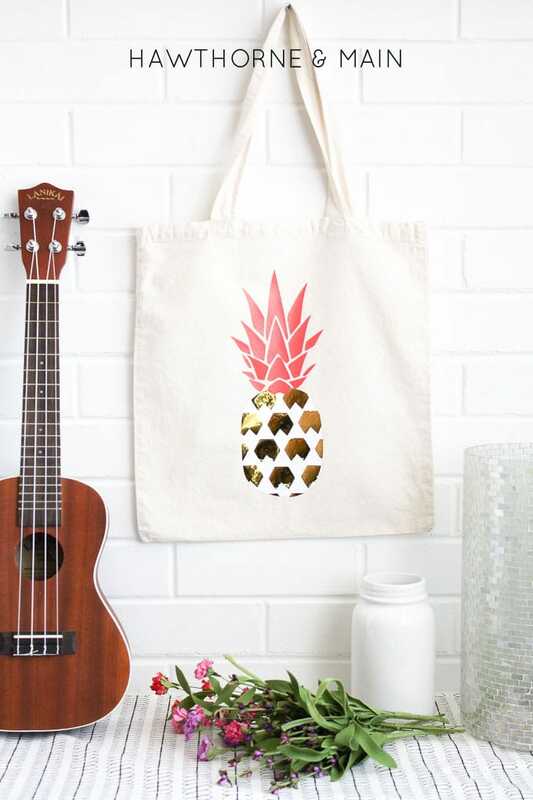 What a great idea to store and at the same time show off your selfmade precious jewellery! Thanks so much! We love it!